An online fashion firm has suspended trading and halted dealing in its shares while it assesses the fallout from the Hertfordshire oil depot fire. 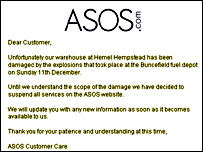 ASOS moved to its new base in Hemel Hempstead, near the blaze site, this year and is examining warehouse damage. Also hit was software and IT firm Northgate Information Solutions, which said offices were "seriously damaged". 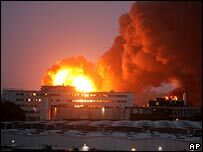 The main distribution centre for Scottish & Newcastle's subsidiary Waverley TBS was also badly damaged. S&N, the UK's biggest brewer, said its Waverly TBS wholesale subsidiary "will have incurred significant asset losses". Dixons and Currys owner DSG International had to close its head office, but said trade would not be affected. The Association of British Insurers (ABI) said damage suffered by business because of the explosion would be covered. "The standard business policy covers that," it said. A vast plume of choking smoke is still billowing from Buncefield fuel depot, near Hemel Hempstead and north-west of London. The first of several explosions hit the site just after 0600 GMT on Sunday, injuring 42 people, two seriously. ASOS - which stands for As Seen On Screen - is one of the UK's fastest-growing retail businesses, selling clothing to fashion-conscious 18 to 34-year-olds. It sells clothes in the style worn by celebrities such as Kate Moss, and in October its website was the second most popular clothing website after Next, with more than 1.1 million visitors. Chief executive Nick Robertson said the fire was "a major blow" for the business in the run up to Christmas, but was grateful no-one was in the warehouse at the time. Its shares closed at 77.5p on Friday, not far off last year's all-time high of 89.5p and above its 23.5p flotation price in 2001. Last month it blamed a profits shortfall on one-off costs of £250,000 incurred from the relocation to its new warehouse at Hemel Hampstead. Meanwhile Northgate Information Solutions, one of the UK's leading suppliers of specialist software for human resources, said four of its employees had been taken to hospital but were later discharged. In a statement to the stock market, Northgate said: "The fabric of the building and the fixtures and equipment inside have been badly damaged. The back-up systems that were in place have also been rendered inoperable. "Northgate's ability to service its customers has therefore been temporarily affected." The firm, whose shares fell in early trade, said a fall-back plan had been put into action, and work transferred to other offices from its main headquarters, where 400 people are employed. "Northgate's financial exposure is limited by its insurance policies that provide sufficient cover for the building and its contents as well as for any business interruption," it said. DSG International said its Hemel Hempstead head office, where 1,500 administrative staff work, was closed on Monday but that its Dixons and Currys stores would be trading as normal. Home computer specialist PC World said it had moved its Hemel Hempstead headquarters to alternative offices. However its shares were not adversely affected after the group said there would be "no disruption" to trading. Meanwhile Scottish & Newcastle said: "We believe that Waverly TBS will have incurred significant asset losses but we believe that all asset and subsequent trading losses will be fully recovered from our insurers." The AIB said some businesses may have taken out denial of access cover, which covers the policyholder for loss of profitability if they cannot get to their business. "They may also have business interruption cover, which would cover alternative accommodation," it said. And the AIB also said some businesses may be putting forward quite large claims. Warnings, first made on Sunday, not to panic buy petrol were reiterated by Tony Blair's office on Monday.